Door knocking is not what it used to be. And maybe even a glass of milk and some fresh-baked, chocolate chip cookies. It’s a lot more difficult. So, if it’s harder than ever and more controversial than ever, why should you do it, you ask? The simple answer is that it works. Even in the digital age — the age of technology, mobile devices, web pages, and social media — the act of getting face-to-face with a prospect and making a personal connection… just works. 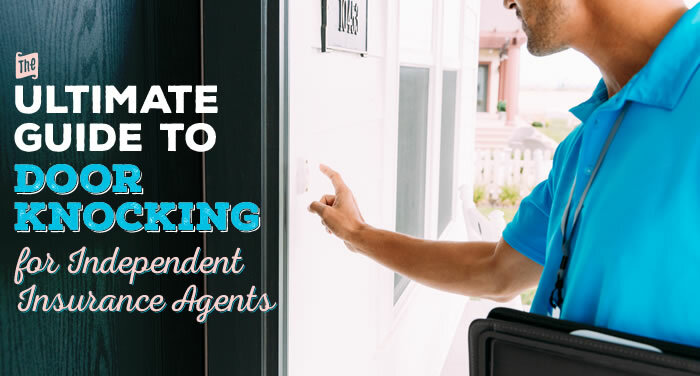 While door knocking is not and should not be your only marketing strategy, it’s arguably the one that can… for lack of a better phrase… get your foot in the door. You should know that all of this material was developed while a new agent began door knocking for the first time. We take you through real-life situations as well as real-life conference calls between mentor and trainee. Michael Sams is the voice you will hear in all of the videos. He is a Sales Associate for Sams/Hockaday & Associates. He trains and mentors new agents and has a book of business that is 1,000+ customers strong. If you’re just starting out with door knocking in general, this little tidbit is for you. Your first two weeks are so critical, because good habits are the key to being a successful salesperson. Once you get stuck into bad habits (check out the 6 worst ones here), it’s very hard to embrace change. And that might sound like a cliche statement, but we see it time and time again. The rest of this guide is going to mesh those good habits into your life so that you don’t get stuck doing the same things (that don’t work) over and over again. Before you even hop into your car, make your first stop, and walk up to that first front porch, you need to get into the right mindset. You are not trying to trick someone into buying something. You are not a sneaky salesman. You have important information. You have conviction. Those people need to hear what you have to say. You are helping people. You are an asset. And that’s conveniently how you make money. And this is where the struggle lies. You have to break the misconception that you are standing at the door just trying to sell something. Because that’s exactly what the person on the other side is thinking. The real struggle is gaining your client’s trust. So, let’s figure out together how to shatter that “tricky salesman” perception. Before you take on any kind of marketing strategy, you need to have an ultimate goal. Every day, you want to knock on 20 doors. And every day, you want to give 5 presentations. And you want 1 of those presentations to turn into a sale. We call it the 20-5-1 goal. When you first start out, your numbers won’t be perfect. They’ll actually probably be far from it. But as the weeks go by, you’ll find that you get closer and closer to that ultimate goal. And the best part about the 20-5-1 strategy is that it’s so easy to pinpoint your weaknesses. You didn’t start early enough. You didn’t go late enough. People in the neighborhood weren’t home. You didn’t have enough leads. What is it? Pinpoint the weakness, and tweak it to get you closer to your goal. Are you not getting 5 presentations? We can pinpoint the problem easily with this one — your introduction at the door is struggling. A lot of agents struggle here with giving away too much information at the doorstep. Or perhaps a bad response to the “Right now just isn’t a good time” sentiment. You can learn more about these issues in the next few sections. The sweet deal with these unfortunate problems is that they’re all fixable. In the beginning, you may need to knock on 60 doors a day to kickstart your business. Your skills will develop, and casting a wide net at first can help you with the learning curve. You’ll get more comfortable, you’ll get your pitch down, and you’ll see more results, which can motivate you to keep on with the grind. So, you don’t have to go with our suggested goal, but do at least set one. Then, you can measure how you’re doing against where really want to be. As time goes on, you’ll be able to narrow down how many doors you’re knocking in a day, because your ratio of success will increase. Picture this: You, my friend, just killed the door introduction. You made a joke, they laughed, and they’re inviting you inside. Your heart is beating a little fast, but you’re staying calm. You breeze through some fantastic small talk (boy, this guy’s got an interesting life story! ), and you transition into why you really came. Your pitch is perfection, and Mr. Jones is ready to sign on the dotted line. You tell Mr. Jones that you’ll get back with him in the next few days to finish up the application. But a few days go by, and Mr. Jones won’t return your calls. You missed your shot. You overcame so many obstacles just to get to the close, but you still walked away empty handed. The worst part? So, here’s what we suggest bringing with you to make sure that doesn’t happen to you. Consider each item and pare it down to your needs. Don’t take a bulky folder or a briefcase with you. You come across as much more approachable if you’re free of a bulky folder or even worse, a briefcase. You can label each tab by product type, or if you only offer a few types of products, you can organize them by carrier name. If you take the folder in with you, you know you’re fully prepared, but many agents will leave this in their car and only take in the apps they know they’ll need (or hope to fill out). For the rate cheat sheet, we recommend pulling up the rates for males and females turning 65. If you have a mobile device with you, just use our quote engine for rates. You can also get access to our short-term care cheat sheets here. We also recommend using the door-to-door sales app called Sales Rabbit. This can make a lot of things easier, but especially bringing up and displaying supporting pieces for your presentation. You don’t want to look like a salesperson carrying a bunch of bulky items. We definitely recommend purchasing a tablet or an iPad — this will be lighter, more comfortable, and flat-out more useful. We also recommend that you never connect to a client’s wifi. Find out why here. At this point, you have a goal, and you have your materials ready. You’re ready to get out of your car and make your trek up to the doorstep. And rightfully so! You’ve done all the legwork up to this point, and it’s finally time to put it all to action. But before you make the jump, change the way you think about this entire process. If you are worried about making people comfortable, you will not succeed. Your focus needs to be on the fact that you can help people. Door knocking can be hard, but you must have conviction and passion about what you’re selling. Have confidence knowing that you have important information. Simply present that information to your prospects without an agenda to sell. From there, your prospects will naturally start to move forward in the sales process, because they’re starting to trust you. And this isn’t some mind game you’re playing. You’re not going through the 8-step selling process to trick people into being your friend so that you can make money off of them. That’s not the case at all. You must have conviction, and you must genuinely care about how you can help these people. That isn’t going to work for you. Let’s say that you’re driving down a road, and you come across a bridge, and the bridge has fallen in. If you keep driving, you’re going to fall and crash. You have conviction. You have passion. You have important information to share. You have to have that same mentality when you’re approaching new prospects. Realize that you’re not bugging these people. You’re providing value. You’re offering a solution. It’s extremely hard to get a stranger to trust you. Heck, your girlfriend of one year still has trust issues — how the heck are you going to knock on someone’s door and become their best friend? All jokes aside, there are a few tricks you can use to help create a quick bond with a complete stranger. This can be a great way to break the ice immediately while also establishing some credibility and familiarity. Hopefully, they let you in, and you can move right into your warm-up. But that won’t stop you. By asking “which one?” the person is forced to choose one of your options. “Too many times, agents spoil their sales opportunity, because they’re trying to get into the home too quickly. The trick is to be aware of when you have established enough credibility and rapport that you can assumptively go into the home and they will embrace it. Instead of trying to get in the door, focus instead on bringing them out of the home. They might be standing behind a screen door or something, so start a conversation about something in the neighborhood. Another tip is to focus on your body language. Don’t come across as a salesman. You want to be casual yet confident. Kerr advises to not always stare directly at the person. Move your gaze from the neighborhood, back to the person, back to the neighborhood, and so on. If needed, you can mimic their mood and attitude in terms of tone of voice and spirit to connect on their level. “Most people you approach in door-to-door sales wouldn't take what you are offering, let alone buy it. When it becomes obvious the potential customer has no interest in what you are selling, move on to the next opportunity. There are a ton of different scenarios of what could happen at the doorstep. If you’d like to be led through how to handle them, download the Door Knocking Flowchart at the end of this article. You cannot skip the warm-up. The warm-up is 20-30 minutes of small talk. Now, small talk can transition into more meaningful conversations, which can be one of the coolest parts of your career, but you have to start somewhere. ...but never skip that warm-up time. If you don’t lay a foundation of friendship, you will find that it’s very difficult to close the sale. “The only difference between a contact and a contract is one letter: r. That can stand for relationship. You can convert more contacts into contracts by building a relationship with them. You’re in the door. You’ve done the warm-up. What now? The 8-step selling process will take you through each step in detail, but you need to transition into the questionnaire. We use what is called a client needs assessment. While you’re asking those questions, you’re looking for coverage gaps. Do they need cancer benefits? What about extended care coverage? Is there money sitting in a bank not earning any interest? Is there money at risk? Prospects need to be educated. For example, do they know that two-thirds of cancer costs are non-medical? Do they know that a 5-year annuity can earn them safe interest on their money? Arm them with information. Remember that after a presentation, most people won’t remember the statistics you spouted off. What they do remember? Stories. Explain what policies you have, and why. Tell them about people you know who have been devastated by medical crises. Bring life into your presentation. So all of that sounds good, but what if they already have a Med Supp? The Med Supp was your calling card! It’s going to come down to cost. “Hey Mrs. Jones, many times I run into people who have a Plan F, and they love their plan. The great thing about that is that every insurance company — by law — has to give you exactly the same benefits. They’re standardized. So, even though you love your current plan, what most people don’t know is that on page 81 of your Medicare handbook, it explains that Medicare Supplements are the same across the board. Even though all insurance companies have to provide the same benefit, that doesn’t mean that their cost is the same. Some companies will have better prices than others. You build credibility by referencing that handbook. Be confident. Once you build that foundational relationship, you’ll find that your client is much more willing to hear what you have to say. You’re done with the presentation. In the 8-step selling process, you know you have to transition into the price and the pause. Here is where things can go south pretty quickly. Do not leave if your client says, “I need to think about it.” Why? Because they won’t think about it. At all. Within 24 hours, people will forget 75% of what you just said. And within 30 days, people will forget 90% of what you said. The people that remembered something? Half of what they remembered was wrong. The point? You can’t let them off that easy. You can learn more about how to handle the “I need to think about it” situation in the Door Knocking Flowchart. Finally, we know that this entire thing is intimidating. It’s not unheard of for an agent to drive up to their destination, look around, and just leave. You’re afraid of being turned down, of all of your techniques not working, and ultimately, of being a failure. But know this: it’s not going to work every time. Even the most experienced of door knockers know that not every person is going to let them inside. But you have to build up the courage to at least try. One trick you can use to make sure you don’t give up is to use what Mel Robbins, life coach, author, and motivational speaker, preaches day-in and day-out. It’s called the 5-second rule. Park your car, and simply count down from 5. When you get to 1, force yourself to get out of your car and walk up to that door. Are you really going to remember that Bob on 1st Avenue has 3 grandkids and is a diehard Cardinals fan? We didn’t think so. If you’re looking for an easy, mobile way to document your notes and interactions with your prospects, Sales Rabbit can be a great solution. We are not affiliated with Sales Rabbit in any way, other than the fact that many of our agents use it religiously, and it makes the entire door knocking process so much easier. There’s a lot you can do with Sales Rabbit, some of which is being able to store all of your sales materials, videos, PDFs, and additional materials in one space. There’s also a leaderboard, so you can track your metrics. How many people did you talk to? How many moved from one stage to another? a variety of other information. It can help prospecting agents to narrow in on candidates that are more meaningful. A lot of this data is public information that’s compiled for you so that it’s all in one, easy spot. It can give you a huge edge up over other agents in your area. The app works without an internet connection as well. A lot of agents spend too much time doing administrative work. Sales Rabbit can take that work out of your hands so that you can spend more time doing the important stuff — connecting with your clients — which means time better spent and more closed sales. If you have questions, software feature suggestions, or requests, reach out to Jason Schow, Product Manager for Sales Rabbit, at jason.schow@salesrabbit.com. And don’t forget to download your free Door Knocking Flowchart below.